3 bed 2.5 bath silver birch forest hideaway near powder slopes, comes with van. Harmony House is a highly rated premier and full-service resort with 3 spacious bedrooms (comfortable beds can be arranged as a king or 2 twins) and 2.5 bathrooms (one bathroom comes with a rain shower and the other comes with a shower and cast-iron soaking tub). Additional futon mattresses can be added to the spacious bedrooms, perfect for children. Harmony House sleeps 6 adults but can comfortably accommodate 8 people. Visitors will enjoy free use of high speed Wi-Fi and 7 passenger van (international drivers permit required for visitors). Easy country driving makes you minutes away from many powder slopes, onsens, restaurants and shopping destinations. The van is all-wheel drive and is equipped with snow tires during winter. Harmony House comes with a complete kitchen: full-size refrigerator, wine refrigerator, cooktop, oven, outdoor grill, microwave, toaster oven, dishwasher, rice cooker, coffee maker, hot water pot, pots, pans, cooking utensils, and fully stocked dinnerware. Grocery stores are nearby so cooking is a convenient option. If you prefer not to cook there are quality restaurants within walking distance, including the very popular Milk Kobo with their famous cheese tarts, roll cakes and soft serve ice cream. 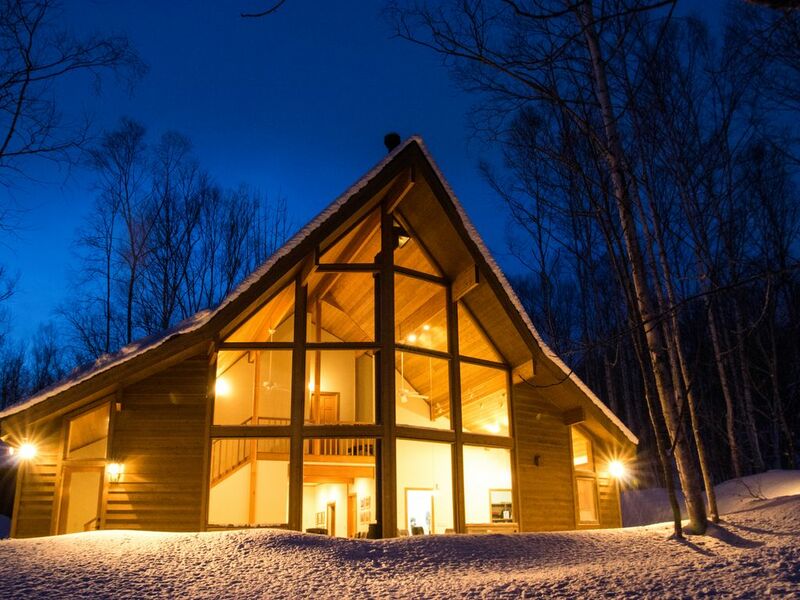 Built in 2014, Harmony House, a renowned Lindal Cedar Homes post and beam design, features a Morso wood burning stove, solid hickory wood floors, heated floor entryway, luxury carpet in bedrooms, walk-in pantry, reading nook, and closets for ski clothes. Harmony House is 191 square meters or 2,056 square feet. A matching Lindal Cedar garage will be constructed in 2018. In addition to covered parking, the garage will provide ski and snowboard storage and an area to tune equipment. There are breathtaking views of the silver birch tree forest, Mt. Yotei, brook and duck pond. Visitors who enjoy nature will love the Harmony House. Harmony House is a 2.5-hour drive from the New Chitose International Airport. The Niseko Train Station (operated by JR Hokkaido) is less than 10 minutes away. Harmony House and its property management company is compliant with the new Minpaku law (colloquailly known as the "AirBNB law"). You can book with confidence. Harmony House is a gorgeous and well-maintained property, but the property management service is what really sets this resort apart. Fujimi-san (speaks Japanese and English) is extremely responsive to guest wants and needs. She offers a full-service experience delivered with pride, typical of the Japanese culture. Minutes from what many consider to be the best powder snow in the world. View of Mt. Yotei. Four seasons: epic powder, scenic spring sakura (cherry blossoms), summer outdoor activities, and breath-taking fall foliage. Delicious locally-sourced fruits, vegetables and dairy. Home-cooked Japanese meals available by pre-order, served in the Harmony House. Free use of 7-passenger van. toilet, shower, bidet, Double sink vanity and Toto washlet bidet toilet. toilet, tub, shower, bidet, Kohler fixtures and Toto washlet bidet toilet. toilet, bidet, Kohler fixtures and Toto washlet bidet toilet. Two full bathrooms and one powder room, all include Toto washlet bidet toilets. Master Bathroom includes double sink vanity and walk-in shower with rain forest shower head. Guest Bathroom includes cast iron soaking tub and separate Japanese style shower. Provides direct access to property manager. Spacious living room with leather sofas. Open kitchen design fully loaded with appliances cookware and dishware. Food catering available through onsite property management company. 7-passenger van comes with property rental. More than 10 onsens (hotsprings) within 10 kilometers of property.